Oleśnica Mała is a place situated by the border of the Lower Silesian and Opole provinces, about 25 km south-east of Wrocław. Driving from Strzelin down the road no 39 to Brzeg, in Miechowice Oławskie you have to turn left under highway and drive down the main road as far as Oleśnica Mała. By the board with the name of the place on the left side of the road the palace is noticeable. The first reference to the village Oleśnica Mała originate from 1189. It was found on the list of villages paying tithes to the cathedral of Wrocław. Also the duke Bolesław I Wysoki raised the hunting castle with the chapel there in the XIIth cent. In 1227 the duke Henryk I Brodaty, son of Bolesław, brought to the local lands the order of Templar knights and handed over Oleśnica Mała along with the neighboring villages to them. It was the only and one documented commandry in the Silesia. In 1314, 2 years after dissolution of the order of Templar knights, the village was taken over by the order of knights of St. John, also called Knights of Malta or Knights Hospitaller. After destructions, which hit the village in 1438 (Hussites) and 1478 (Polish armies), at the turn of the XVIth and XVIIth cent. the extant castle in Oleśnica Mała was enlarged. The subsequent destructions were brought by the Swedish War (1642) and great fire from 1706. 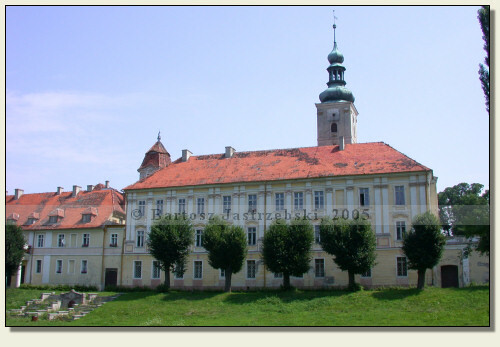 After the reconstruction in 1711 the castle was given the shape of a baroque palace. Oleśnica Mała has remained in hands of knights of St. John until 1810. In 1810 ensued secularization of church goods and Oleśnica Mała came into the property of Prussian Treasury. In 1814 for the contribution to Napoleonic wars the village became the property of the count Hans Ludwig David Yorck von Wartenburg. His family made a transformation of the monastery, into which over a span of centuries turned the castle and chapel, into a secular mansion. Unfortunately, the palace together with an adjacent park was devastated by the Soviet armies in the time of World War II. After the war Oleśnica Mała became the Polish property, and in 1955 the palace along with the park were handed over to Institute of Cultivation and Acclimation of Plants. That is exactly the institution, to which the palace owes its rebuilding.